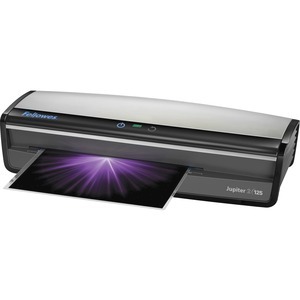 Advanced, six-roller laminator delivers rapid laminating speed up to 30" per minute. InstaHeat warm-up technology starts the laminator in a minute. Unique AutoSense system detects pouch thickness and self-adjusts to the optimal laminating setting. Advanced Pouch Tracking System detects and reverses pouch in case of misfeeds. Auto shutoff prevents overheating when not in use. Robust, six-roller system provides superior lamination quality. Laminator laminates hot pouches up to 10 mil thick as well as cold pouches. It includes a laminating starter pack.